Posted in Alumni, Featured, News. 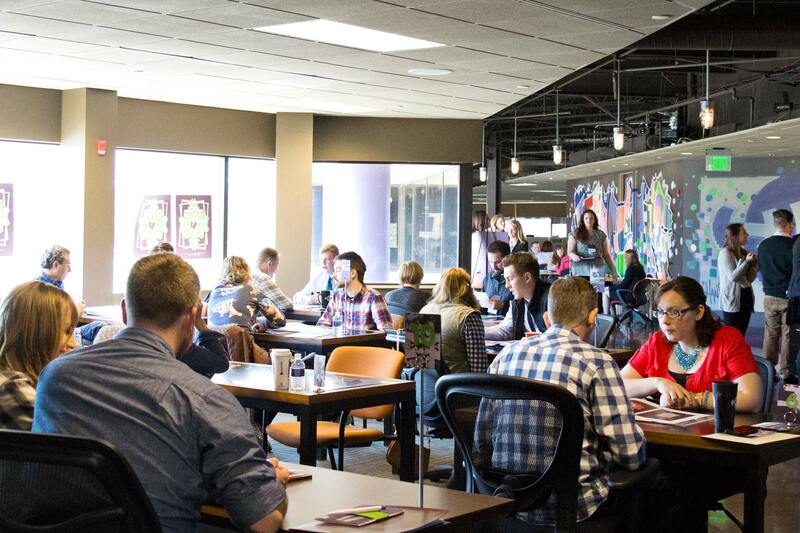 The Ninth Annual AIGA Toledo/BGSUGD Portfolio Review Day is Saturday April 9, 2016 and BGSUGD is seeking designers to review student portfolios. The nearly decade long tradition has a growing legacy of placing aspiring student designers at the helm of branding the entire event from the ground up. Students are selected by faculty for independent study and make use of their semester crunching numbers with faculty to work out print and collateral impact, racing against deadlines to send out branded event announcements and print time, and of course, coordinating the event itself. The student selected to design for the 2016 review is BGSUGD Junior, Kate Blankerts. Former student designers have been awarded notable achievements including a HOW Magazine International Design Award and an Adobe Achievement Award, as well as receiving one on one portfolio reviews with keynote speakers from the likes of Joshua Davis, Kelli Anderson, Gail Anderson, and many more. Reviewers are invited to submit their names to take part. Reviewers are typically professionally practicing designers working in the field and are expected to review a revolving assembly of student portfolios offering insights and advice based on their experience in the field. The portfolio review day also features breakout sessions during which speakers host short lecture series on topics of their choice meant to inform students and attendees alike about a particular issue, idea, or angle in the field. If you would like to take part as a reviewer, please contact us here.